One of the most popular players for Seattle's Seahawks is Marshawn Lynch, his appeal is three pronged. He plays in Beast mode all the time, he loves Skittles, and he doesn't like talking to the media. His beast mode wins him games, his Skittles love has all the children over him, but his media silent treatment only gets him on the wrong side of the NFL. The Seattle Seahawks running back was fined $100,000 for not appearing at press briefings earlier in the season, and the NFL was threatening to fine him another $500,000 if he did not make it to the Super Bowl Media Day. 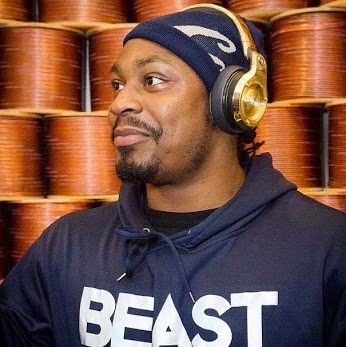 But since the fine, Marshawn Lynch has become much wiser. He now attends all the press events he needs to be at. But what's that they say? You can take a horse to the water but you can't force it to drink. The star player's answers to any question that get thrown at him by journalists has become a comedy punchline in Seattle. It's either, "Thanks for the question, I appreciate it" or "I'm thankful". When he's had some Skittles, he may crack a smile and answer, "Yeah..." But I hear Lynch switched it up for the Super Bowl media day. The Score reports once he sat down facing the media, he told them that no matter what question they asked, he'd respond the same way every time: "I'm just here so I won't get fined." And he did exactly that for the next five minutes, which was his contracted time to spend with the media, before taking his exit.